Westland Horticulture have joined forces with horticulturist, garden writer and RHS medal winner Peter Seabrook, to celebrate container gardening at this year’s prestigious Chelsea Flower Show. 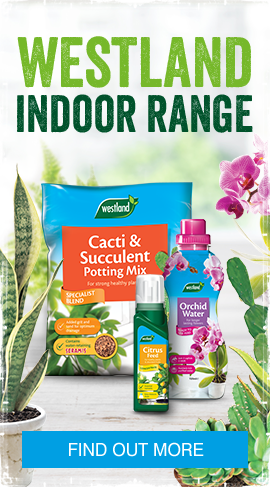 Having launched a new indoor plant care range this year, Westland Horticulture are delighted to be working in partnership with Peter to deliver an inspiring display of indoor plants. This popular area of gardening is accessible to everyone, no matter what level of experience they have. Peter Seabrook’s ‘Container Revolution’ display is a pyramid of four sides, showcasing a number of flower and vegetable plants that can easily be grown in containers, both in the garden and the home. Designed around the key trends in indoor gardening, Westland Horticulture have collaborated with Peter to create an indoor plant display on one of the pyramid sides with a focus on air purifying plants, living walls, miniature gardens and edible gardens. Demonstrating an environmentally conscious theme the display also utilises a number of containers that have been re-used, recycled and up-cycled. The display also features new seed varieties from Burpee including Chilli Pepper Lemon Dream and Tomato Patio Plum, great varieties that can be grown both indoors on the windowsill, as well as on the patio. The ever popular Strawberry Marshmello plants from Marshalls Seeds will also feature on the display, especially bred for flavour this variety is a favourite amongst gardeners every year.